Part of the primary goal of this blog is to encourage careful, critical consideration of how technology is impacting our lives and affecting how we see ourselves. This week episode of PBS’ Frontline, “Generation Like” does an excellent job of doing just that. The one-hour documentary, narrated, written, and produced by Douglas Rushkoff, explores how major corporations use social media to get teens to market their products for them. More importantly, this documentary explores the fact that our new, highly networked culture has begun a race for attention and affirmation. Social media has given us a chance to tell our stories to the world, but is anyone listening? And if they aren’t, but what does that say about us? How does one get attention in an online world where thousands (if not millions) of voices are all screaming for eyeballs? What we see in the documentary is that teens, in a effort to be “Liked”, are increasingly willing to shape and mold their personalities into whatever gets that attention and affirmation. While the show focuses on teens and social media, the same behavior can be seen on more “grown-up” forms of social media, such as LinkedIn or any dating website. “Generation Like” is an informative, insightful, and important documentary that should be required viewing for anyone who uses social media (or the internet). Douglas Rushkoff (who’s work we’ve previously discussed on this site) has hit another one out of the park. 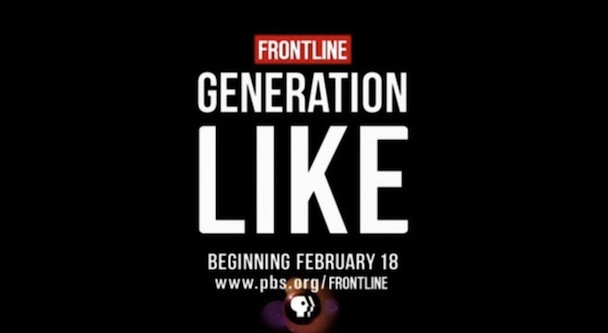 Watch the full “Generation Like” documentary on Frontline’s website (LINK). What does a culture increasingly focused on peer approval and acceptance mean for Christianity – a faith that calls its adherents to be in the world, but not of the world – (John 17:14-15)?